On September 18 nearly 300 students, teachers and non teaching staff of the DU from across the city participated in a protest rally under the aegis of the Safe University Campaign to present a Charter of Demands to the Vice-Chancellor to demand that the campus be made a zero tolerance zone towards sexual harassment. The Policy on Sexual Harassment and Ordinance XV (D) was passed after a sustained campaign by the university community between 2001-2003. Under the requirements of the ordinance each college is mandated to form required committees of UUCC, CCC and CPCC to create awareness about sexual harassment and to inquire into any complaints, whose ruling would have been binding on the college authorities. However a study conducted by the SUC revealed that the implementation of the ordinance was abysmal. Nearly 90% of the respondents agreed that sexual harassment was a major problem in the campus yet they were clueless about the existence of such an ordinance. In many colleges the required committees had not been formed. The aim of the rally was also to generate awareness and to create public pressure on the administration to take up the issue on a scale as massive as that of the Anti-ragging and Anti-smoking campaigns, both of which have been highly successful. Some of the demands included allocation of a permanent space in each college for the display of the names and contact numbers of the members of the Complaints committee and making each university member sign an undertaking at the beginning of the year saying that he/she is aware of the Ordinance. 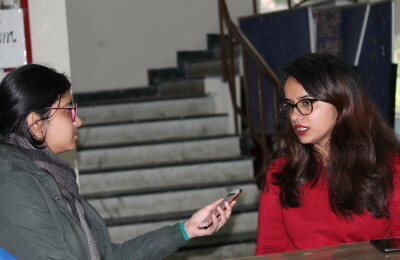 The protestors also demanded that the University should ensure that all colleges have active Sexual Harassment Complaints Committees and Gender Sensitization Committees as per the Ordinance and that these bodies should be made more accountable. The delegation received a mixed response from the administration and a date for a follow up meeting has been fixed. The campaign is an ongoing movement and they hold public meetings every Tuesday at 4 PM in the arts faculty to which concerned students are invited to show their support for the cause.